Wiling to pay a fair price. if this one doesn't pan out , Their is one on e-ban. Interesting name for an antique store. I looked at the machine online. Way overpriced given the condition. I appreciate the lead though. These machines show up all the time at VCA. I might just wait to get one there. I sent you an email with a few questions. JHSS-1944 wrote: if this one doesn't pan out , Their is one on e-ban. I couldn't find it, could you provide the item #? different searches ON e-bay Does turn up totally different stuff. bought 1 machine this way & lots of "needed parts". for what ever reason ,doesn't show up under (just) slot machines. have to try ...parts, vintage, collectible, ect., ect. 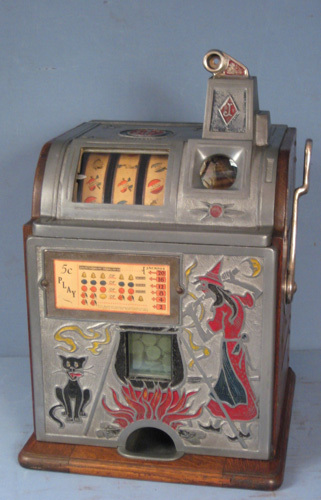 (with slot machine...) sometimes the company name alone helps pop up stuff not seen under any other search. Did you get a Ciga-Rola for your customer? If not, I have one I'll sell.